Smores Blondies let you hold on to summer as long as you can– the calendar and the hot weather surely are not over yet so let’s not let the start of school dampen that summer enthusiasm! Today we’ve got plenty of desserts to keep your summer block parties going. 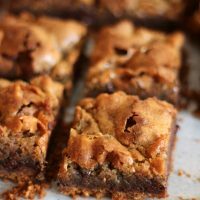 These s’mores blondies start with a graham cracker base then are topped with a blondie batter filled with marshmallows and chocolate chips. The result is a chewy bite that will remind you of sitting around the campfire enjoying s’mores. 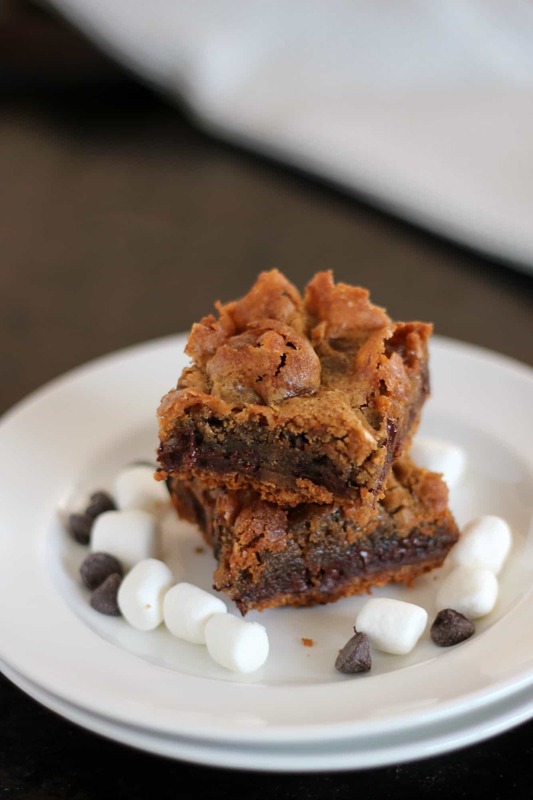 I think next time I make this treat I will top them with more melted chocolate and browned marshmallows, but even without that extra decadence, these dessert bars will hit the spot. Blondies are great in any flavor– try these white chocolate and macadamia nut blondies, butterscotch blondies, or traditional blondies. These s'mores blondies start with a graham cracker base then are topped with a blondie batter filled with marshmallows and chocolate chips. The result is a chewy bite that will remind you of sitting around the campfire enjoying s'mores. Preheat oven to 350 degrees F. Prepare an 8 x 8 glass pan with parchment and baking spray. Melt the butter and combine with the graham cracker crumbs. Pat down into the pan in an even layer. Beat the butter and sugar on high speed until well blended. Add the vanilla then the eggs. Continue to beat on high until smooth and thick. Add the flour and salt and mix on low until barely incorporated. Finally add the mini marshmallows and the chocolate chips; fold in with a spoon or spatula. Gently lay scoops of the batter on top of the unbaked graham cracker crumbs. Spread the batter out evenly. Bake for 40 minutes; cover with aluminum foil if the top browns before the middle is baked. Remove and let cool on a wire rack. Recipe based on While Chocolate and Macadamia Nut Blondies recipe from the book Williams-Sonoma Dessert of the Day, page 182. This data is provided by Nutritionix and is an estimate only. Peach Pie Cookies by Live. Bake. Love. I’m wanting to hold on to summer as long as I can. I get sad when fall arrives and all the green in the landscape turns to brown and grey. Nice blondies and great choice for an end of summer treat. S’mores bring back such great memories of camp. I’d happily settle down with a bunch of these and reminisce. They look great! Absolutely fit for the theme ! 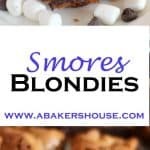 the blondies look scrumptious ! Holding on to Summer is what I’m trying to do! But it’s kind of hard when the retail stores are already setting up for fall! This cookie definitely has Summer written all over it! I’m in for S’mores anything! These look incredible! Love anything s’mores! I’ve made similar ones and I can attest to how good they are. S’mores were the only good thing that came out of my brief camping experience with girl scouts! Hope you are doing well, Holly.